Now this environment is threatened by massive new housing developments. You can download a copy of the VDS here. (Please note it is a large file 8MB pdf). Printed copies are also available on request. 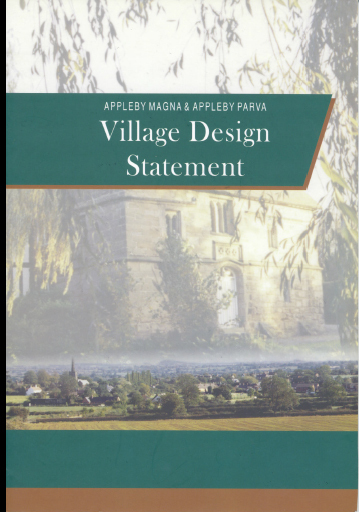 The Village Design Statement is part of local planning policy (Supplementary Planning Guidance) so you can quote any guidelines in objections to planning applications. We think the following guidelines are particularly relevant. Guideline 2. In order to sustain the strong community spirit the rate of development should be slow enough to allow newcomers to integrate into the community. Guideline 3. Development should respect the boundaries and compact nature of the existing development mix. Guideline 7. The diversity of the village should be retained with new buildings integrating with the existing environment, and avoiding regimented and socially isolated developments. Guideline 22. The countryside to the west and north of Appleby Magna is particularly important as a buffer zone protecting the village’s rural character from the intrusive nature of the motorway and major roads. In addition, residents consider this to be an attractive area in its own right, the importance of which should be recognised. Special consideration should be given to ensuring these important factors are retained. Guideline 26. The rural aspect of the village seen from the approach roads should be retained by avoiding solid blocks of development visible at the boundaries. Spaces should be left to retain views into and out of the village. Natural features should be used as shielding to preserve the rural appearance. Guideline 28. Appleby Magna’s essential settlement pattern, of a compact village nestling in the bottom of a valley, and its old road network should be respected as part of village heritage. Guideline 32. Green and other undeveloped spaces in the village, and the green corridors connecting them, both within the village and from the village to the surrounding countryside, should be conserved wherever possible. Guideline 41. The ridge and furrow fields around Appleby are very old pastureland and should be particularly valued and retained in their present state. Guideline 42. Estates of standard housing design are not appropriate in Appleby. Linear development, regular house layout and regimented design should be avoided. The existing variety of house sizes, shapes and rooflines should be maintained. New developments should match the variation in plot shapes. Linked and partially linked buildings would reflect local examples. Guideline 47. New housing should have regard to the local vernacular style. Appropriate characteristic features should be incorportated in new designs but mixing styles or historical references in the same building and ersatz ‘period’ features that look obviously artificial should be avoided. Guideline 61. Undue widening of roads at junctions should be avoided.